We are supposed to be smack in the middle of summer here, but it rains on almost all days. While it certainly has brought the relentless summer to a halt, there are days on which I wish the weather had a bit more sunshine in it. The neighbourhood cat, whose name in our home varies from Ginger to Maa-Woo to Kitty Katty to Mamma Cat to anything and everything in between (we don't know her real name), shares my sentiments. We have our reasons, albeit different ones. As for me, my affection towards rain largely depends on where I am. I love to sit and just soak up all that a monsoon has to offer, right from the overcast skies to the initial drizzle and the deluge that follows; provided I am at my home in Kerala. On the other hand, Bangalore rains more often than not end up as nuisances, at least to me - sad downpours, ensued by hours of traffic blocks, inches of dirty brown water and a general feeling of congestion. On top of all that, it is becoming a daily routine to having to call it a wrap as soon as I set up anything to shoot. Ginger, though unperturbed by traffic jams and fading lights, loathes anything that splashes and generally makes a mess of the fur coat. Also, it will be a calamity if someone chooses to fry fish and she is not able to hop along drenched terraces and low walls and ‘Meow’ at them. Or if they have their back turned, help herself to a piece or a plate full of fish. So when the weather turns moody, both of us heave a sigh and contemplate on all things sad. In line with out of season rains, I have an out of season recipe today. Gajar ka Halwa, though it can be prepared with normal carrots too, is traditionally prepared with Red Winter Carrots that are known as Delhi Carrots here. 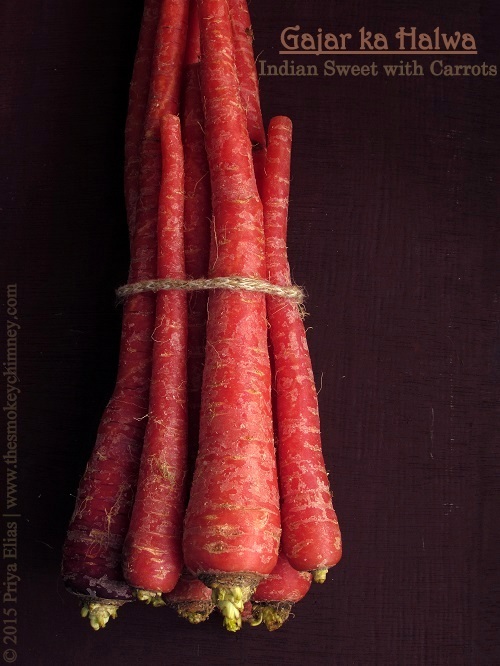 Winter is long gone, and so are the Red Carrots. But these were shot on a similar, moody day some weeks back when I thought I will put the last of the Delhi Carrots to good use. I have always felt that compared with the more robust, slice-able concoctions from Kerala like the Jaggery laden Black Halwa, the Flour and Sugar based White Halwa or the Amber coloured Milk Halwa, Carrot Halwa comes out as a weaker contender. I am not saying that Carrot Halwa is not delicious. It is, and furthermore, is a good way to celebrate seasonal produce. If you will turn a blind eye to the sugar content, it might even look healthy for a moment. Also, you can whip up some pretty striking desserts with it (though it is a dessert itself). Thinly layer it on Parfaits, serve along with Vanilla Ice cream or make streaks with it in the ice cream, fill it in crepes and may be even use as a filling in dumplings along with grated coconut. Take a large, heavy bottomed pot and add the carrots as well as the milk in it. There must be some free space at the top as the mixture will froth a bit. Heat the mixture over a medium flame, stirring frequently. (Do not cover the pot.) The mixture will come to a boil, froth and slowly reduce. Be very careful that you don’t burn the mixture. Do not leave the mixture unattended. Meanwhile take a pan and heat up 2 table spoons of ghee in it. Add the cashew nuts and fry till they turn colour. Take them out and keep aside in a bowl. To the same pan, add the raisins and fry them in the leftover ghee. Remove them as soon as they plump up and keep them aside along with the cashews. Save leftover ghee, if any. Once the liquid content in the Halwa pot has reduced by about 70 percent, add the sugar. (Start with a 3/4 cup.) The water content of the sugar will again loosen the mixture. Reduce the flame to a low and keep sautéing the mixture till the liquid content has lessened again. In between, check for sweetness and add more sugar if needed. Now add the ghee and mix well. By this time, the Halwa would have turned a deeper shade, compared to the bubbling stage. Stir around for a few minutes and then add the fried nuts and raisins along with the ghee in which they have been fried. Add the cardamom powder as well, mix thoroughly and taste the Halwa. Serve warm or at room temperature as a standalone dessert or experiment with the suggestions made at the end of Introduction above. You can use a food processor to grate the carrots. I do them manually with a box grater – but it obviously takes more time and effort. The recipe makes enough to approximately fill a one litre container. Since a little goes a long way, you might need to halve the recipe. You can avoid either or both cashew nuts and raisins, if you don't like to add them. You can add sliced Pistachios as garnish instead. The Halwa if made as above will stay good for five to seven days in the refrigerator. Freeze if you want to store it for longer periods. This is a post that has been roosting amongst the drafts in my old blog for more than a year, mainly owing to a bad photography session at the time. Though I had re-shot the curry sometime in February, I didn't get around to editing the photos till now. The plan was to just edit the photos last night and get the writing part readied later. But that was before my sister, S sent me the photo of what seemed to be a twelve foot long spider that she had found at our home back in Kerala. (Okay, may be twelve is exaggerating it a bit. But you have to make allowances for my mind that has been in an addled state ever since I set my eyes upon the giant. I can tell you one thing though - it certainly does not belong to any stream that even remotely believes in petiteness.) By the time I made the Techie delete all traces of the offender, I was wide awake and cosy beds and blankets seemed to have lost the charm they held five minutes ago. The good thing is that I was able to get the post ready to be published in a few minutes. I'm sorry if aphids are not your thing and you would rather not have read the passage above. They are not my thing either and I am not particularly sure why I felt compelled to jot it down. We will blame it all on S and hop to less animate, but happier things. This is an everyday chicken curry; simple, comforting and yet full of flavours. All you need to do is rest the chicken in a simple marinade, saute a few ingredients before simmering the marinated chicken in the coconut milk based gravy and then finally, make a very basic tempering of mustard seeds and curry leaves to top it off. We usually have it with rice, but they go well with rotis and appams too. Homemade Meat Masala Powder - 1 tsp. Kashmiri Red Chilli Powder - 1/2 tsp. Ginger, chopped - 1 tbsp. Garlic, chopped - 1 tbsp. Coriander Powder - 1 and a 1/2 heaping tbsp. Homemade Meat Masala Powder - 1/2 tsp. Marinate the chicken with the ingredients mentioned under 'The Marinade' and keep aside for half an hour. Mean while, crush the ginger and garlic together well and keep aside. Heat up some oil in a pan and saute the onions till they are a medium brown. Add the crushed ginger garlic mix and saute till the raw smell is gone. Keep the flame very low and add the powders. Stir around for a few seconds and then add the marinated chicken. Increase the heat to a high and stir around everything for a minute. Take care not to burn anything. Now add the thin coconut milk and once the gravy comes to a boil, reduce the flame to a low. Cook covered till the chicken is well done. Add the thick coconut milk, bring the gravy to a gently simmer and switch off. Add half a teaspoon of the meat masala powder, mix, check for seasoning and adjust. To make the tadka, heat up a pan with some coconut oil. Add the mustard seeds and once they sputter, add the curry leaves, give a stir and then quickly tumble the whole of the contents (including the oil) on top of the prepared chicken curry. Let the curry rest for at least half an hour for the flavours to blend. Mix the tempering with the curry when you are about to serve. Serve as a side for rice, rotis (flat breads), appams (rice crepes made from a fermented batter) or idiyappams (steamed rice noodles). The gravy is supposed to be of a medium consistency, though you can adjust it to your liking. You can add a touch of water/more thin coconut milk to the gravy and bring it to a boil before adding the thick coconut milk if you think the curry is too thick. On the other hand, if the curry is too watery, simmer it with the lid open for some time before adding the thick coconut milk. I use a natural white vinegar for the marinade. If you think your vinegar is too strong, add less than half a tablespoon in the marinade and the rest if needed once the chicken is cooked and you do a taste test. You want the curry to be balanced, not tangy. It is better not to use boneless breast pieces alone in the curry. The curry works best with skin-out, bone-in, not-so-lean assorted pieces of a chicken, simmered well in the gravy. However a few pieces of lean meat will be okay. Use just enough oil when sauteeing as well as tempering. With the oil, coconut milk and the chicken fat (if any), it is possible that a thin layer of oil might form on top of the curry when rested. The good news is that you can just skim it off. The past few weeks have been difficult for us. The same day that we lost my late mother's brother MC, the Techie, who had been having fever for a couple of days, suddenly sprouted Chicken pox rashes. Once their survival in the midst of hostile medicines had become dubious, the poxes gracefully marched on to my terrain. Our attending physician (who also happens to be a retired Colonel) told us in a lighter vein ‘this is the price you pay for not getting it as children’. True that! All is fairly well now, though it will probably take another couple of weeks for us to be back on what can be deemed a normal routine. Well, all except the fact that we couldn't attend MC's funeral and that we will miss seeing my sister and brother in law who have popped down for a vacation from London. I don't like how this year is turning out at all. But one has to move on. Come whatever, I mostly keep a stiff upper lip and leave the rest to God Almighty. An unemotional and detached front or a pretence of such is my refuge, when life takes bitter turns. And in keeping up with that deceptively nonchalant demeanour, we will switch the conversation to Cardamoms. One of the most expensive among spices, Green Cardamom, with its distinctively strong, yet captivating taste and aroma is a favourite spice of mine. The spindle shaped spice is used widely in sweet as well as savoury dishes in India, not to forget as flavouring in drinks including teas and lassis (yoghurt smoothies). Although only the dark seeds enclosed within the papery outer layer of cardamom pods are usually used in making cardamom powder, for most other uses including the making of spice powders like this Meat Masala Powder, the whole pod is used. I don't know if all of you are aware of this - the pods of cardamom grow near the base of the plant and offer a slightly unusual sight. This is the third in line of the spice series, which is primarily meant to be a series of photo posts. You will find these posts lacking in any prolonged discussions on the spices themselves and I apologize for the lack of a solid write up, if you were expecting it. If circumstances permit, another photo series on how these spices are grown at my native place might be done at a later time. That there is a 'Black' Cardamom as well has been a revelation to me a few years back; a note or two on that in another post.